I LOVE this card, Maureen! It is so colorful and fun with the hexagons and the ruler banner (how did you do that?) Is that a stamp on brown paper? So cute. TFS!! 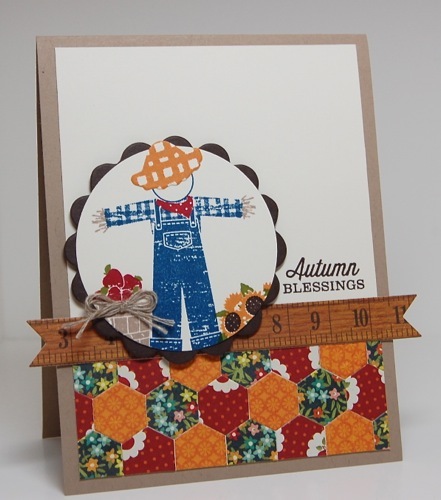 Oh the scarecrow with the hexagons below is so, so adorable! This is so super cute, love the great card design and the cute image. The octagon layers are so cute!!! Thanks for playing with us over at ATS!!! Love your card, Maureen! Thanks so much for sharing it with us at the Simon Says Stamp challenge this week! Your card is beautiful, Maureen! Those wonderful hexagons took my breath away! Love your paper choice! gorgeous hexagon patchwork!! looks like fabric!! oh wow, this is so cute, totally love that scarecrow! Je l'ai mise dans ma galerie Pinterest.